The State Capitol Monument is the largest and oldest monument on the grounds of the Alabama State Capitol in Montgomery. The monument was designed by Alexander Doyle of New York. It was completed in 1898 after 12 years of construction at a cost of $46,000. 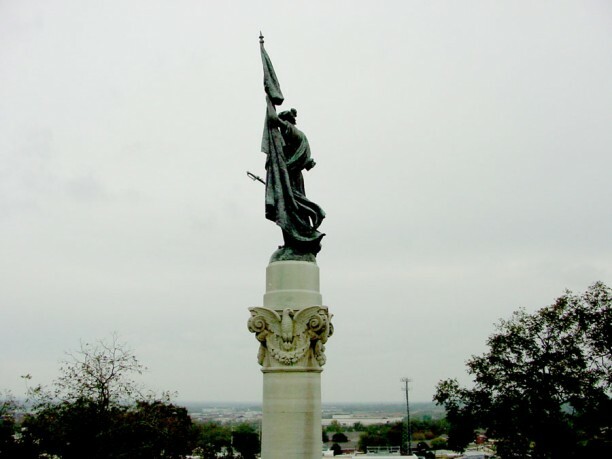 The Monument includes a limestone base, four granite figures, a limestone shaft featuring a large bronze relief band near the base, and a bronze figure on the top. The four figures represent Cavalry, Infantry, Artillery, and the Navy. The bronze base relief is symbolic of a battlefield, and the bronze figure atop the 70-foot tall shaft is symbolic of womanhood and patriotism. In 2001, Carraway and Associates was commissioned by the Alabama Historical Commission to select and coordinate a team of conservation professionals to determine the condition of the bronze, limestone, granite, and general metals that comprise the monument and to write specifications for cleaning, repair, and maintenance of these materials. As indicted in the photos, the stone immediately beneath the sculptural bronze frieze and statue had stains from the bronze alloys. Both the bronze and stone components had irregular surface coloration that resembled dirt and indicated the presence of moisture trapped behind various coatings. Some of the stones at the base of the monument were separating along the bedding planes and many of the stonework joints were open. Cracks in the monument in several locations suggested structural problems that were addressed by our firm and the team as well.